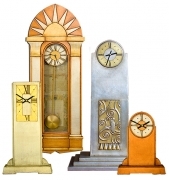 Large wall clocks are my passion and after a life time's work creating this eclectic collection of stunning decorative clocks it has been my goal to make their design, styling and finishing second to none. 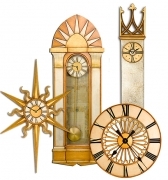 Weather you're looking for a small or large wall clock, in a gilded or paint finish then this collection will have something for you. 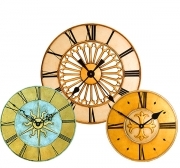 Simply click on the category of decorative clock you are interested in to see the full collection. 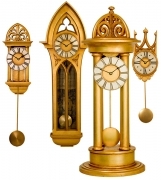 What makes my decorative clocks so interesting and different from any other are their gilded finishes and their styling which is inspired by the major European decorative art movements which give my decorative wall clocks that all important air of sophistication. 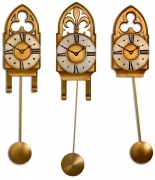 The right style for your decorative clock. 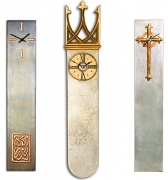 With over 20 years designing & making decorative mantle clocks I have build up an eclectic range of clock styles & designs covering the major decorative movements including ranges of Gothic Clock, Palladian Clock, Classical Mantle Clock, Regency Mantle Clock, Art Deco Clock. 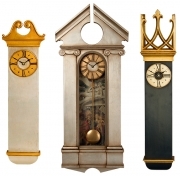 I'm always interested in adding new decorative clock designs to my collection so if you are after a specific style or design of wall or mantle clock then get in touch as it might be one to add to my collection. 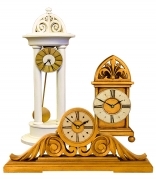 The right finish for your decorative clock. 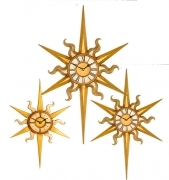 I specialise in gilded leaf and paint finishes so I am able to cater for most tastes. 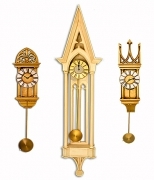 Traditional gilded finishes have a timeless sophistication but they come in only two colours -gold and silver. 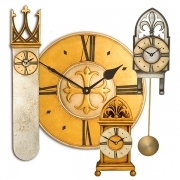 This is fine if you only require a gold mantle clock or silver mantel clock so to overcome this limitation I have developed an exciting new range of ‘paint & leaf' and tarnished leaf finishes.